Southern California Gas Co. said on Thursday it has temporarily controlled the flow of natural gas spewing from a ruptured underground pipeline that forced the relocation of thousands of residents of a Los Angeles neighborhood. The company, a unit of San Diego-based Sempra Energy, said in a statement that while this was a “positive development,” more work needed to be done before the leak would be permanently sealed. It said cement needs to be injected from a relief well into the leaking well, which is slated to occur in the coming days. Following that, state regulators would have to verify that the leak has been sealed before it will be declared over, the company said. That process is expected to take several more days. “We have temporarily controlled the natural gas flow from the leaking well and begun the process of sealing the well and permanently stopping the leak,” Jimmie Cho, SoCalGas senior vice president of gas operations and system integrity, said in a statement. The leak stems from an underground pipeline rupture at the company’s 3,600-acre Aliso Canyon natural gas storage field in the San Fernando Valley. The leak, detected on Oct. 23, is believed to have been caused by a broken injection-well pipe several hundred feet beneath the surface of the field. The largest such leak ever in California, at its height it accounted for a fourth of all methane emissions statewide. 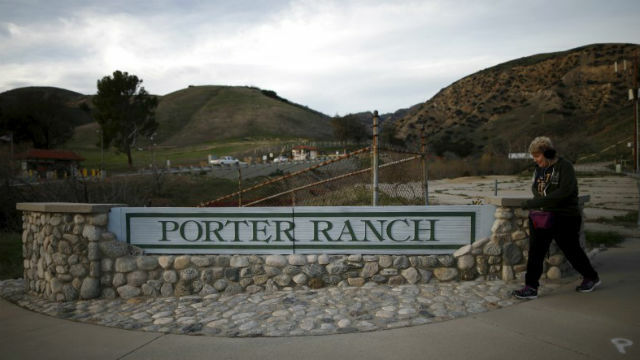 Thousands of residents of the Porter Ranch community near the field were forced to relocate because of the leak. SoCalGas said it would wind down its relocation program for displaced residents once the California Division of Oil, Gas and Geothermal Resources confirms the leak has been sealed. More than 20 lawsuits against SoCalGas have been filed by residents over the leak, along with civil claims by Los Angeles city and county, the state of California and air quality regulators. County prosecutors have also filed criminal charges. A week ago, the first wrongful death claim over the methane leak was filed, saying the conditions hastened the demise of an elderly woman already suffering from lung cancer.